ever since i was little, i've had a love/hate relationship with rings - and still do to this day! most of the time, i lose them and end up feeling awful. why do i lose them? well you see, i love to wear rings, but i find they aggravate my fingers. i don't feel "free" when i'm wearing rings. so i take them off - sometimes just for awhile, other times i slip them in my bag in order to be rid of them completely. who knows where they end up after that! if you don't believe me - let me first tell you about "safety village." which in retrospect, didn't end up being all that safe since i almost had to have my finger cut off! perhaps that is a bit of an exaggeration - but that doesn't make the experience any less frightening. i was about seven years old and my class went on a field trip to safety village - a miniature town in which we could drive miniature automobiles and learn road safety rules. while we watched a video indoors, i began to play with the little band around my ring finger (who gave a seven year old a ring??). i unconsciously tested the ring on other fingers until suddenly - it was stuck! i looked down and saw that i had somehow squeezed that little piece of metal around my middle finger! now, if you wear rings, then you know that most middle fingers are at least two sizes bigger than a ring finger, if not three. i told a teacher, who took me to the bathroom to try and soap the ring off. no luck. another teacher suggested we stick my finger in a pile of snow outside. excellent idea, but the ring remained. so they took me to the hospital! there was no amputation, in fact the removal of the ring was painless but the memory is somehow ingrained in my mind forever. the memory says "rings are not for you - give it up!" but i'm a fighter! 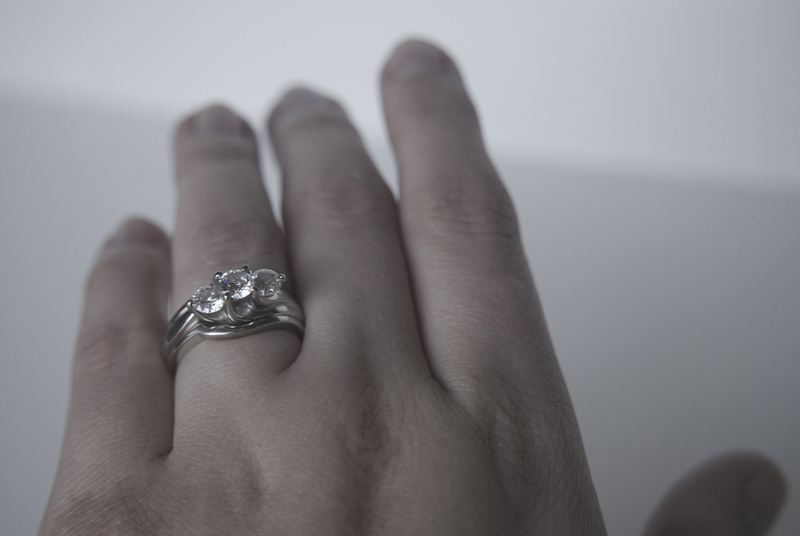 and when my future husband presented me with this chunk of metal two years ago, i knew it would be a constant battle. are you shaking your head at my candidness? well, no need to worry because jon does not read my blog. but seriously, this is not what one would refer to as a "slim band." 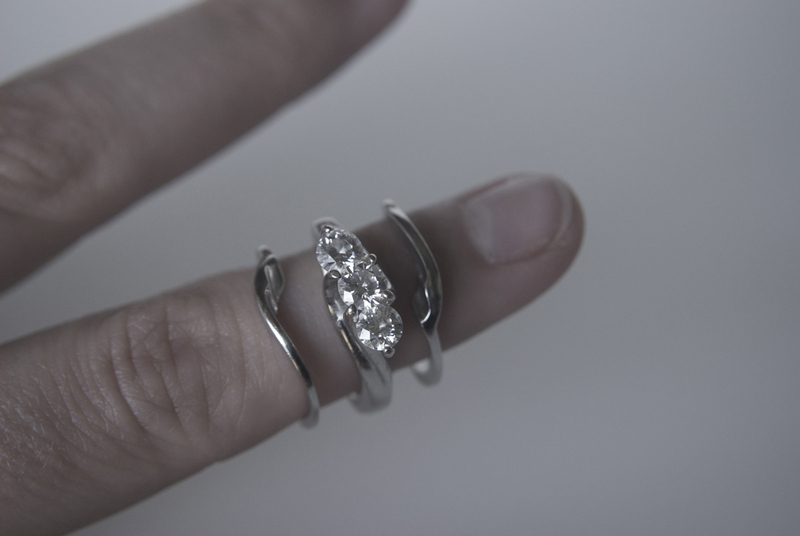 and when the time came to pick the wedding rings, it seemed like a fun idea to have two (one on either side). of course being overweight makes wearing all three incredibly difficult, and even on the best of mornings, my fingers are too swollen to put them all on. so i slide them on my pinky or grab just two. don't misunderstand me - i love my rings! they are beautiful and unique and someday they will fit me. i'll even admit that since i don't find it natural to wear rings, i kind of like the awareness that they are on my finger. a constant reminder of my husband and our love for one another. and aside from that one time i left them at the tanning salon - i never let them out of my sight. I love those stanking rings, they are so cute! But take my word for it, your fingers don't look chunky! They're lovely finger-shaped fingers. 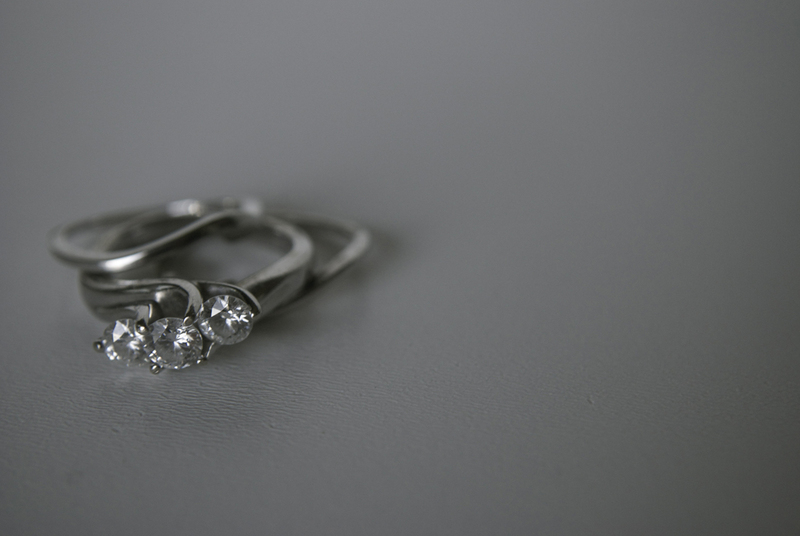 Your rings are beautiful! 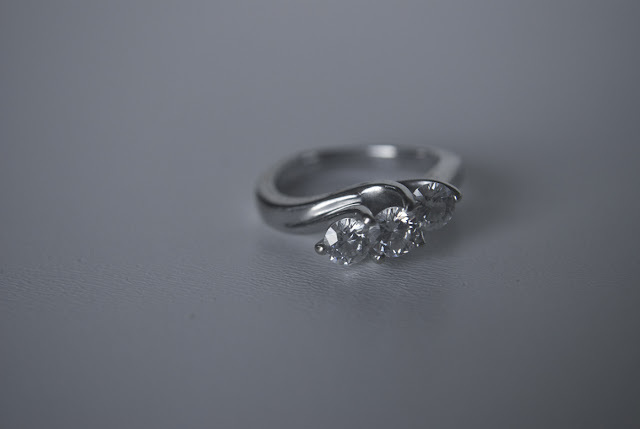 I never wore rings until I got married, and even now, I only wear my wedding band and pull out the engagement ring with the diamond for special occasions. Beautiful rings! I feel the same, so my wedding and engagement rings are super thin and light! I take them off a lot though when cooking, painting etc.